Coral Castle is a stone structure created by the Latvian American Edward Leedskalnin (1887–1951) north of the city of Homestead, Florida in Miami-Dade County at the intersection of South Dixie Highway (U.S. 1) and SW 157th Avenue. The structure comprises numerous megalithic stones (mostly limestone formed from coral), each weighing several tons. It currently serves as a privately operated tourist attraction. Coral Castle is noted for legends surrounding its creation that claim it was built single-handedly by Leedskalnin using reverse magnetism and/or supernatural abilities to move and carve numerous stones weighing many tons. Edward Leedskalnin was jilted by his 16-year-old fiancée Agnes Skuvst in Latvia, just one day before the wedding. Leaving for America, he came down with allegedly terminal tuberculosis, but spontaneously healed, stating that magnets had some effect on his disease. Edward spent more than 28 years building the Coral Castle, refusing to allow anyone to view him while he worked. A few teenagers claimed to have witnessed his work, reporting that he had caused the blocks of coral to move like hydrogen balloons. The only tool that Leedskalnin spoke of using was a "perpetual motion holder". Leedskalnin originally built the castle, which he named Rock Gate Park, in Florida City, Florida around 1923. He purchased the land from Ruben Moser whose wife assisted him when he had a very bad bout with tuberculosis. Florida City, which borders the Everglades, is the southernmost city in the United States that is not on an island. It was an extremely remote location with very little development at the time. The castle remained in Florida City until about 1936 when Leedskalnin decided to move and take the castle with him to its final location on 28655 South Dixie Highway Miami, FL 33033. The Coral Castle website states that he chose to move in order to protect his privacy when discussion about developing land in the area of the castle started. He spent three years moving the Coral Castle structures 10 miles (16 km) north from Florida City to its current location in Homestead, Florida. Leedskalnin continued to work on the castle up until his death in 1951. The coral pieces that are part of the newer castle, not among those transported from the original location, were quarried on the property only a few feet away from the southern wall. Leedskalnin charged visitors ten cents a head to tour the castle grounds. There are signs carved into rocks at the front gate to "Ring Bell Twice" and a second sign just inside the property that says "Adm. 10c Drop Below". He would come down from his living quarters in the second story of the castle tower close to the gate and conduct the tour. Leedskalnin never told anyone who asked him how he made the castle. He would simply answer "It's not difficult if you know how." When asked why he had built the castle, Leedskalnin would vaguely answer it was for his "Sweet Sixteen." This is widely believed to be a reference to Agnes Skuvst (whose oft-misspelled surname "Scuffs" is not even a legitimately formed Latvian word). In Leedskalnin's own publication A Book in Every Home he implies his "Sweet Sixteen" was more an ideal than a reality. According to a Latvian account, the girl existed, but her name was actually Hermīne Lūsis. When Leedskalnin became ill in November 1951, he put a sign on the door of the front gate "Going to the Hospital" and took the bus to Jackson Memorial Hospital in Miami. Leedskalnin suffered a stroke at one point, either before he left for the hospital or at the hospital. He died twenty-eight days later of Pyelonephritis (a kidney infection) at the age of 64. His death certificate noted that his death was a result of "uremia; failure of kidneys, as a result of the infection and abscess." While the property was being investigated, $3,500 was found among Leedskalnin's personal belongings. Leedskalnin had made his income from conducting tours, selling pamphlets about various subjects (including magnetic currents) and the sale of a portion of his 10-acre (4.0 ha) property for the construction of U.S. Route 1. Having no will, the castle became the property of his closest living relative in America, a nephew from Michigan named Harry. The Coral Castle website reports that the nephew was in poor health and he sold the castle to an Illinois family in 1953. However, this story differs from the obituary of a former Coral Castle owner, Julius Levin, a retired jeweler from Chicago, Illinois. The obituary states Levin had purchased the land from the state of Florida in 1952 and may not have been aware there was even a castle on the land. PRISM conducted an investigation of the Coral Castle on the night of April 27, 2015. Attending were PRISM Miami Director David Pierce Rodriguez, PRISM investigator and Medium Gerard Leiser, PRISM investigator and Case Manager Eric Vanderlaan, PRISM Psychic Ana M. Echeverri-Mourao. We were accompanied by a television crew from El Camino on Univision / Galavision. The travel show is hosted by Danilo Carrera, Roger González and Fernanda Kelly and airs premiered on June 19, 2015. Video clip (in Spanish) from Paranormal Research & Investigative Studies Miami (PRISM) @ the Coral Castle in Homestead, Florida on the show El Camino on Galavision and Univision. El Camino starring Fernanda Kelly, Danilo Carrera, and Roger Gonzalez aired on Galavision on August 7, 2015 and Univision on August 8, 2015. Video clip de El Camino con PRISM en el Coral Castle en Homestead, Florida. El Camino, protagonizada por Fernanda Kelly, Danilo Carrera, y Roger Gonzalez, y transmitido por Galavision el 7 de agosto, 2015 y Univision el 8 de agosto de 2015. This video was recorded on a full-spectrum modified GoPro Hero 3 and a Tascam DR-05 digital audio recorder in Edward Leedskalnin's bedroom at Coral Castle in Homestead, Florida on April 27, 2015 by PRISM Director David Pierce Rodriguez. Vehicle noise from nearby US-1 can be heard as well as people talking just down the stairs on the 1st floor. As a truck drives past, an eerie moan can be heard coming from inside the bedroom. Afterwards, PRISM Director David Pierce Rodríguez ascends the stairs and enters Edward's bedroom to adjust the camera. Once David heads back down the stairs, an orb shoots out of the rocking chair. This was the only orb recorded on video the entire night. This video was recorded on a full-spectrum modified GoPro Hero 3 in Edward Leedskalnin's bedroom at Coral Castle in Homestead, Florida on April 27, 2015 by PRISM Director David Pierce Rodriguez. 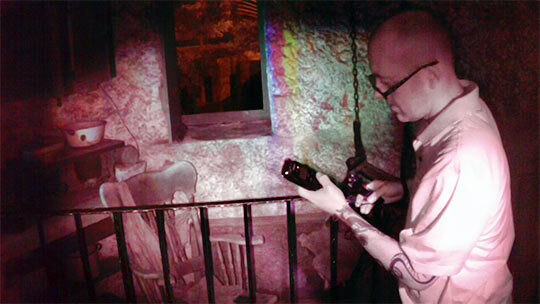 Just after David sets up the full-spectrum GoPro and shows his cell phone to the video camera to mark the time and date, an EVP is recorded. Note that a precursor pop/click can also be heard immediately before and after the voice. Street traffic from highway US-1 can be heard in the background. The bedroom is empty and the sound of cars on highway US-1 can be heard in the background. Both the Ovilus III ITC research device and the Tascam DR-05 can be seen resting on Ed's bed. Could this be possible contact with Edward Leedskalnin? Anomalies recorded in Edward Leedskalnin's bedroom by PRISM Director David Pierce Rodriguez. This video was recorded on a full-spectrum modified GoPro Hero 3 in Edward Leedskalnin's bedroom at Coral Castle in Homestead, Florida on April 27, 2015 by PRISM Director David Pierce Rodriguez. On November 28, 2005, PRISM Founder David Pierce Rodriguez, and PRISM investigator Josie R., conducted an afternoon investigation of Coral Castle in Homestead, Florida. A tour of the property was taken, and interviews were conducted with two of Coral Castle's staff. Many photographs and short bits of video were taken. Baseline EMF readings were taken. The EMF floor measured a constant 1 to 2 mG within the castle's walls, with a few exceptions (EMF spikes) found along the castle grounds. It was an area located by the easternmost of three stones along the South Wall, that an EMF spike registering between 4 to 5 mG was recorded throughout the preliminary investigation. The spot where this occurred was noted in the area marked by an 'X' on the ground, at an approximate height of 3 to 5 feet. Coincidentally, it was in this area where a female psychic recently told the staff that a secret room might be found below ground. *UPDATE: A paved walkway was constructed over this area in approx. 2011. The EMF floor in the second floor living quarters in Coral Castle measured an average of 1.5 to 2.5 mG, versus the average EMF floor of the rest of the property which measured between 1 to 2 mG. The photo below shows the readout of our CellSensor EMF meter at centered at 2mG in side of the living quarters. We were told by the Coral Castle staff that a team who had investigated the property in the past, noticed unusually high EMF levels in the living quarters. We did notice that an EMF spike of approximately 1 to 2 mG occurred across the top part of the metal railing around the room. An interesting thing was noted in what is known as the cooker (a.k.a. Ed's BBQ.) The EMF floor in Coral Castle measured an average of 1.5 to 2.5 mG, but when the meter was brought into the cooker area, the EMF level would go down to zero (0mG.) This did not occur in any other area inside the walls of Coral Castle.